***this is a sticky post, please scroll down for new entries, thank you! What I love most about the internet? The world becomes my oyster. Almost any thing and everything becomes accessible to me. Hard to find books and cosmetics are suddenly within reach with a simple click of a button. However, what I love most are the unbelievable deals I am able to score online. Nothing quite beats Black Friday Sale plus cheap travel accomodations and airline budget seat promos that are almost always exclusively available through their websites…case in point are round trip tickets to Hong Kong that I purchased recently for just P2000 at 1 in the morning. E-commerce is at its highest point but a lot of people I know are still iffy about taking advantage of its obvious perks. Why? Because along with the abundance of online opportunities also come various forms of fraud with the most common being of the credit card type. I can’t blame them for feeling apprehensive, I myself have been haunted by these fears one time or another. Online shopping is fun but having your credit card information stolen is no joke and most credit card companies just offer run-off-the mill security checks which I’m pretty sure certain hackers will have no problem catching up to one time or another. Maybank’s new Secure Online Shopping service provides a safe and secure shopping experience with unique features such as their One-Time Password which sends a code to your registered moile phone to verify your completed purchase before your mastercard or visa card gets charged. It’s a quick full-proof and hassle-free process that needs no assistance from customer service. But if you do find yourself in a bit of a pinch, want certain questions answered, your password changed or a supplementary card enrolled in the program, you can call their 24/7 free hotline at +63 2 588 3888 or their PLDT Domestic Toll Free number at 1-800-10-588-3888. No more waiting in line at a “bayad center” just to complete my purchase! Now I can take advantage of numerous online deals without the worry. 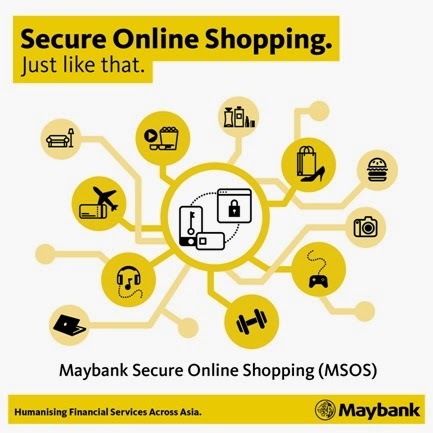 Enjoy the same perks, ask about Maybank’s Secure Online Shopping today. Pretty sure my calves won't fit on those. They look so cool and awesome.